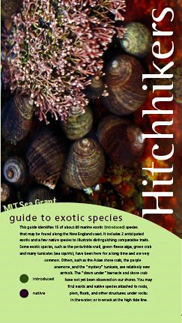 The MIT Sea Grant Hitchhikers Guide to Exotic Species is a field guide for beachcombers, students and other interested citizens. It is printed on waterproof paper and contains color photographs and information on several introduced species and a few native species (for comparison). It may be used simply for your information, or to help us track the spread of these species. The purpose of the Recreational Diver Monitor data collection effort is to augment the presence/absence data in the New England ANS database for the 10 selected species divers were trained to identify. Divers were asked to gather general quantity data for the species as well. But since many of the tunicates on the list are best quantified by surface area covered, not the number of individuals, the reliability and accuracy of such data is not expected to be high. Accordingly, the procedure divers were trained to follow when collecting data is primarily oriented toward presence/absence observations. Divers were clearly told at the training that the nature of their involvement in the data collection is strictly voluntary, and that the sponsoring universities and organizations were not requesting, nor requiring, that divers collect data at any specific site, date, or depth, or using any specific tools or aids (such as pictures, slates, or cameras, for example). Divers were specifically told that they are not in the employ of the sponsoring universities or organizations, and that decisions about the diving are entirely their own.